Wilson Electric is a fully licensed and insured Electrical Contractor featuring Master Electricians with more than 25 years' experience in Fairfield and Westchester Counties. MOST RELIABLE SERVICE IN THE INDUSTRY. Have us install a new, completely automatic standby generator for you, and whatever mother nature throws at you: hurricanes, ice storms, tornadoes, downed power lines, blackouts or brownouts, you will never be in the dark again! 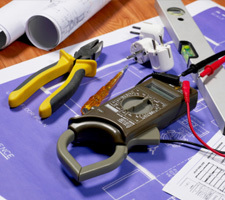 We perform safety checks of your home, electrical examination and reports for new purchasers, service and panel upgrades, installation of appliances, indoor and outdoor lighting and motion sensor controls, mounting and wiring of chandeliers, bathroom and attic exhaust fans, new and replacement switches, dimmers, outlets and GFCI devices, and whatever other electrical needs you might have. We install entertainment equipment, from flat-screen TVs to entire home theater systems. We will wire your cable system and telephones. We can do an energy evaluation of your home, whether for safety purposes, or so that you can have a “greener” carbon footprint, for standby power, or to help you save money on your energy bill. We can even design the electrical system for your entire home. Want to add some pizzazz to your yard? We can design and install site lighting to beautify your home’s exterior. Hear a noise outside when you’re home alone? No worry, you have motion-sensor floodlights which will illuminate your entire yard the moment anyone sets foot on your property. Dreaming of a hot tub, sauna or pool, entertainment center or game room? We can install these for you for less than you imagine. You won’t want to go on vacation with a spa in your own backyard. Whatever your needs, whatever your dreams, we can make them a reality—quickly, professionally, safely, and on a budget you can live with. Free consultations available. Call 203-359-1200, or contact us online. Serving Fairfield County, CT and Westchester County, NY. Service areas include but aren't limited to Stamford, Greenwich, New Canaan, Darien, Norwalk, Westport, Conn., and Armonk, New York.